"Jayme is the hero in this case," said Barron County Sheriff Chris Fitzgerald in an afternoon news conference where he shared new details about the case and 21-year-old Jake Thomas Patterson who is in custody on probable cause murder and kidnapping. 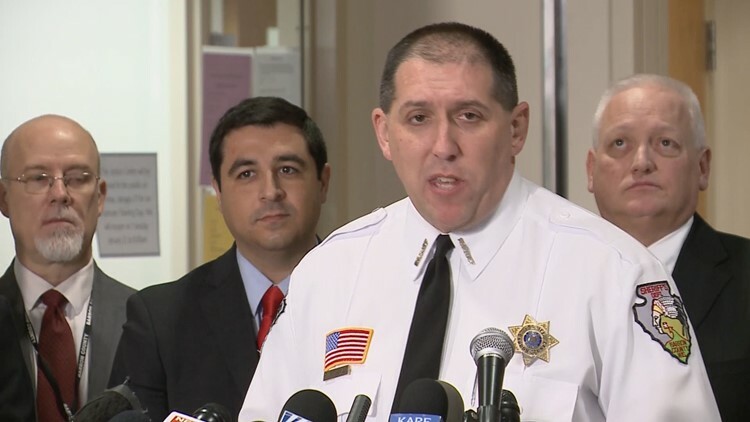 BARRON, Wis. — Barron County Sheriff Chris Fitzgerald says the suspect in the abduction of Jayme Closs was apparently searching for her after her escape. The sheriff said Friday afternoon that 21-year-old Jake Patterson wasn't at home when Jayme escaped Thursday afternoon. RELATED: Who is Jake Thomas Patterson? Earlier Friday, authorities identified Patterson as the suspect arrested in the kidnapping of the 13-year-old and the murder of her parents last October. Patterson of Gordon, Wisconsin, is in custody on probable cause murder and kidnapping. Closs was taken back to her hometown of Barron on Friday and reunited with her aunt. Closs will soon be reunited with her other relatives. Fitzgerald says investigators have recovered more than one gun, including a shotgun consistent with the type of gun used to kill Jayme's parents, James and Denise Closs. He says the shotgun still needs to be tested to determine if it was the weapon used. "The gun used at the scene on the night of the incident was a shotgun. It was also used to shoot open the door at the Closs home on the night of the incident. The door was not kicked in," said Fitzgerald. Fitzgerald says investigators have no evidence that Patterson knew anyone at the Closs home or had contact with anyone there. And he says investigators don't believe there was a social media connection between Patterson and Jayme. He says investigators don't know how Patterson "became aware of Jayme." The sheriff said that Jake Patterson changed his physical appearance before the October attack and the abduction of Closs, including shaving his head to avoid leaving any hair behind. He says investigators believe Patterson killed Jayme's parents to abduct her. "The suspect planned his actions, and took many proactive steps to hide his identity from authorities," Fitzgerald asserted. Douglas County Sheriff Tom Dalbec described how shortly after 4:30 p.m. Thursday a resident of the Town of Gordon was out walking her dog when a thin, disheveled girl approached and said she was Jayme Closs. That woman hustled Jayme to the door of a nearby home and told the resident to call 911. A short time later, Dalbec said, a patrol sergeant spotted a vehicle with a description provided by Jayme, pulled it over and took Patterson into custody. Shortly afterwards, Sheriff Dalbec called his counterpart in Barron. "I mean it was first unreal and is it true, and then when we confirmed with Sheriff Dalbec’s team, that it’s confirmed that it was her, my legs started to shake man, it was awesome," Fitzgerald recalled. "It was just the stress and relief, I mean it was just it was awesome... I don’t have a different word, it was just fabulous, it was just great." Patterson was taken to the Douglas County Sheriff's Department in Superior, Wis., and then transported to the Barron County Jail in Barron, where he remains. Fitzgerald told reporters they are not looking for additional suspects. Barron County Sheriff announces the arrest and potential charges that face 21-yyear-old Jake Patterson of Gordon, Wis.
Fitzgerald said Patterson has zero criminal history in Douglas County and zero criminal history in the state of Wisconsin. His investigators are currently in Duluth-Superior with Jayme interviewing her for details on the kidnapping and her time in captivity. "We do believe Jayme was the only target," Sheriff Fitzgerald shared. "We also do not believe at this time that the suspect had any contact with the family." On Friday afternoon the Associated Press reported that Patterson worked with Jayme's parents at the local Jennie-O Turkey Factory for one day three years ago, but offered no evidence that the three had contact with each other. Steve Lykken, president of the Jennie-O Turkey Store in Barron, issued a statement Friday saying 21-year-old Jake Patterson was hired one day but quit the next, explaining that he was moving away from the area. An obituary for James and Denise Closs says they worked at the turkey processing plant for 27 years. Lykken says the company and the Hormel Foods family are "overjoyed at the news of Jayme's safe return." As for the teen and the suspect, Sheriff Fitzgerald said without hesitation that Jayme and Patterson had NOT had contact via social media. Another news conference has been set for 4 p.m. to share an update with additional information. Barron County Attorney Brian Wright says it is his intent to have a criminal complaint filed by next week. "It is our job in prosecuting this case to obtain justice for James, Denise and Jayme Closs. We will do so," he insisted. Though the sheriff and investigators from the FBI and Wisconsin Department of Criminal investigation collectively told reporters they could share few details as they are still building the case, there was a great deal of emotion on display when discussing Jayme, and her will to survive. "Law enforcement locally and across the country continued to comb through over 3,500 tips and the family never gave up hope," Fitzgerald said, describing the collective effort to bring the child home safe. "Last night our collective promise was fulfilled with Jayme’s safe recovery. Thank you to all." The Wisconsin Department of Criminal Investigations' Brian O'Keefe took pains to emphasize the mission and camaraderie shared by dozens of law enforcement officers as they worked to break a frustrating case. "This case had so many challenging technical elements and everybody never blinked about putting aside their personal lives to bring a little girl home, and the work that got done, I haven’t seen this much work on any one case I’ve ben involved with," O'Keefe said. "The friendships and professionalism of all agencies at every level have been beyond what anyone can expect. A lot of people are very emotional about recovery, it’s a happy thing, but now we have to work on recovery process and we’ve reached out to a lot of professionals to help this young lady and her family." The voice of Barron Area Public Schools Superintendent Diane Tremblay broke as she described how students and staff have coped in Jayme's absence. "What has it been like in the Barron Area School District in the past months? It has been 88 days of hope for her safe return. 88 days of prayers for Jayme, her family, friends, our students staff and community. 88 days of holding onto faith that our authorities would never give up and they certainly did not," Tremblay shared. "Finally, 88 days of our close-knit community with the same goal in mind... and that was to bring Jayme home and back into our arms." Jayme's aunt Jennifer Smith opened a P.O. Box for people to send cards and well-wishes. Gifts can be sent to: Light the Way Home for Jayme Closs P.O. Box 539 Rice Lake, WI 54868.